Bible that belonged to Josiah Henry Greene and wives Susan (Converse) Greene and Laura (Hanks) Greene of Vermont. 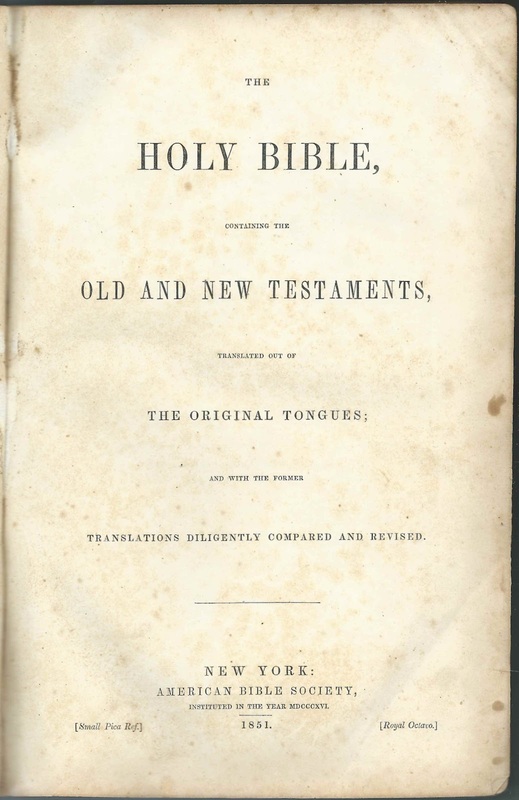 The Bible, published by the American Bible Society of New York, New York, in 1851 measures approximately 10-1/2" by 7" by 2-3/4" inches. 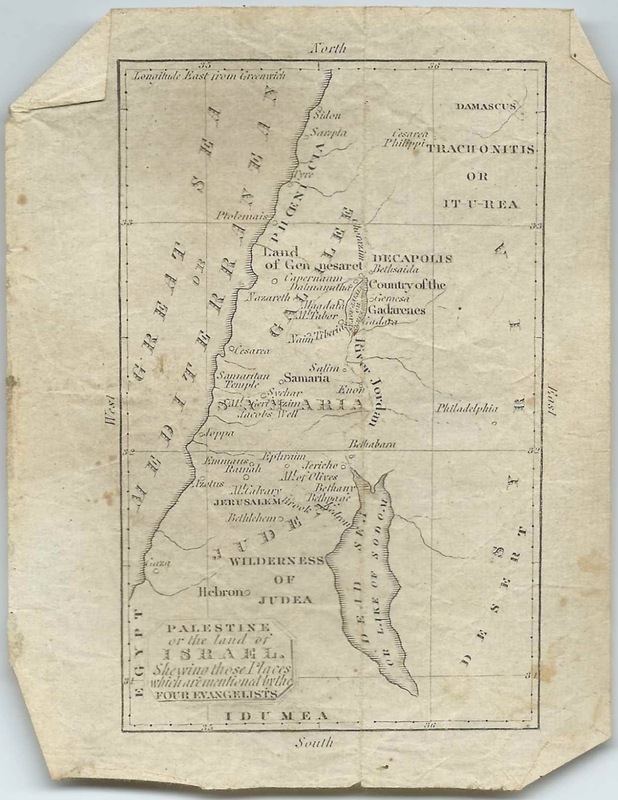 Images of the Family Record pages appear at the end of this post. Josiah Henry Greene was born at Hanover, New Hampshire, on February 1, 1800, the son of Josiah and Susan (Greene) Greene. 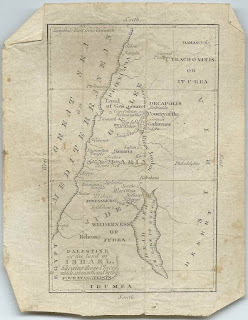 Josiah moved to Randolph, Vermont, about 1811. He married Susan Converse on November 11, 1834. 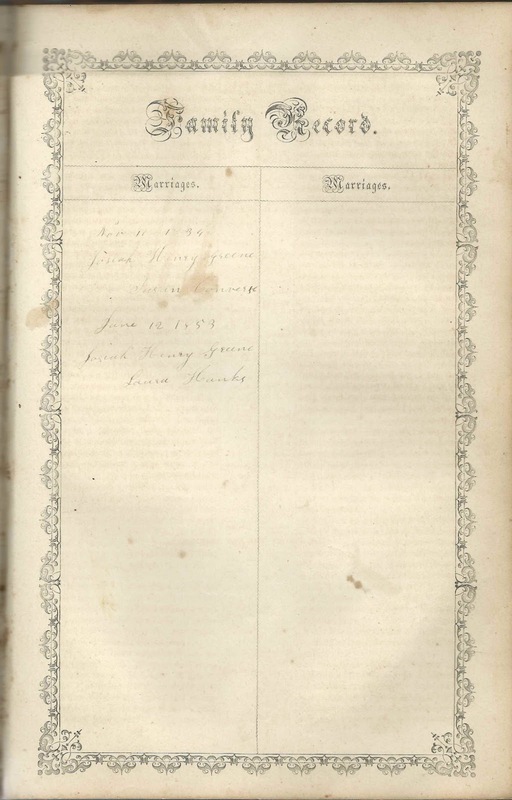 The marriage date is in the Bible but not the place, but it was presumably Randolph, Vermont. Susan's birth year of 1793 is recorded in the Bible. 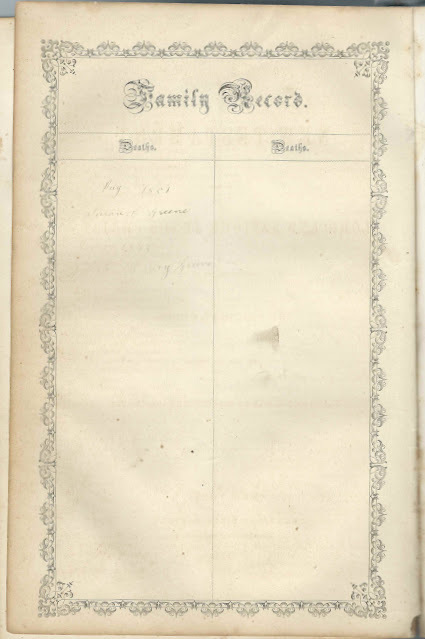 Another entry shows that she died August 1851; her Find-a-Grave listing gives the full date as August 26, 1851. She's buried in the Randolph Center Cemetery at Randolph, Vermont. There are no children for Susan listed in the Bible. I believe Susan's parents were Joseph Converse and Mary (Johnson) Converse, who, along with several of their children, are also buried in the Randolph Center Cemetery. On June 12, 1853, Josiah Henry Greene married Laura Hanks, whose birth date in the Bible is shown as October 27, 1815. 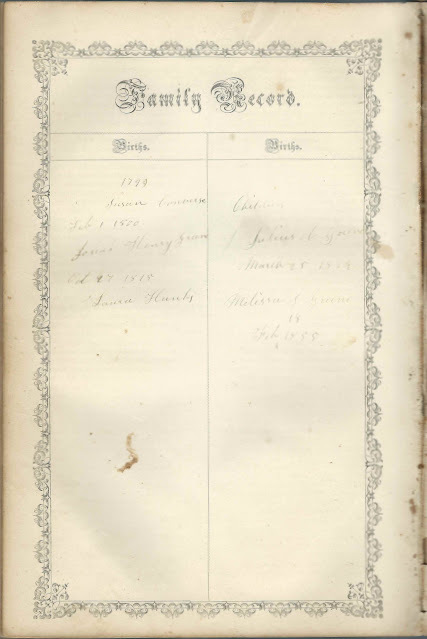 A Vermont birth record shows that Laura was born at Randolph Township, Vermont, to Theophilus Sargent Hanks and wife Patty (Stevens) Hanks. Julius C. Greene; I noted that one place online had Julius' middle name as Converse; if so, this was presumably a tribute to Josiah's first wife, Susan (Converse) Greene. 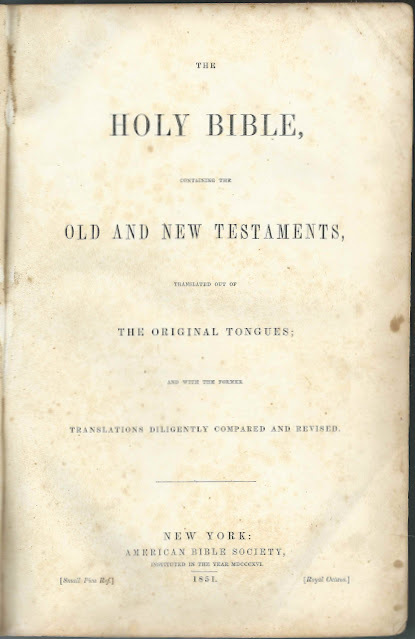 The only two death dates in the Bible are for Susan (Converse) Greene and Josiah Henry Greene, who died November 12, 1875. Josiah and Laura, who died in 1885, and their two children, are buried in the East Randolph Cemetery at East Randolph, Vermont. 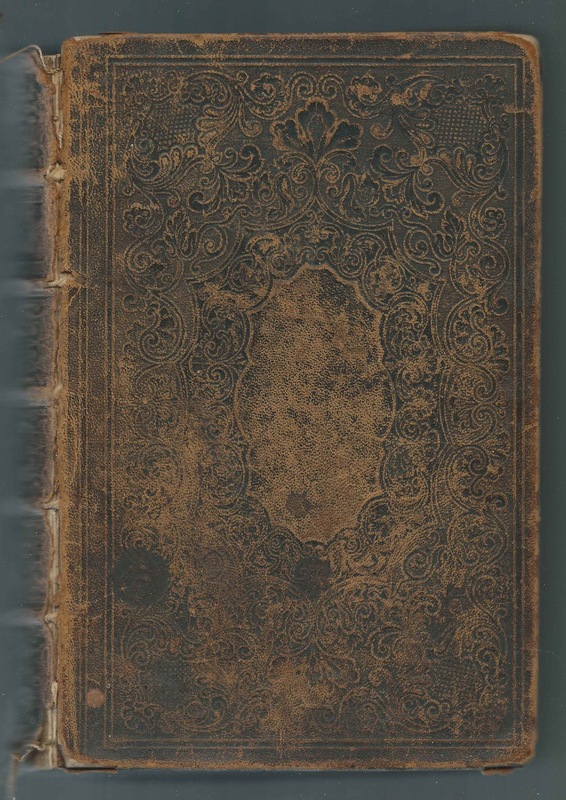 Read more about Josiah's family and how he happened to come to Randolph, Vermont in the Illustrated Historical Souvenir of Randolph, Vermont, Compiled and Published by Nickerson & Cox in 1895, on page 67. If you have information to share on the family of Josiah Henry Greene, please leave a comment or contact me directly.